Featuring a meditative environment “Nightlands 3,” an oscillating video that explores our connection to the oceans and our dependency on the water cycle. 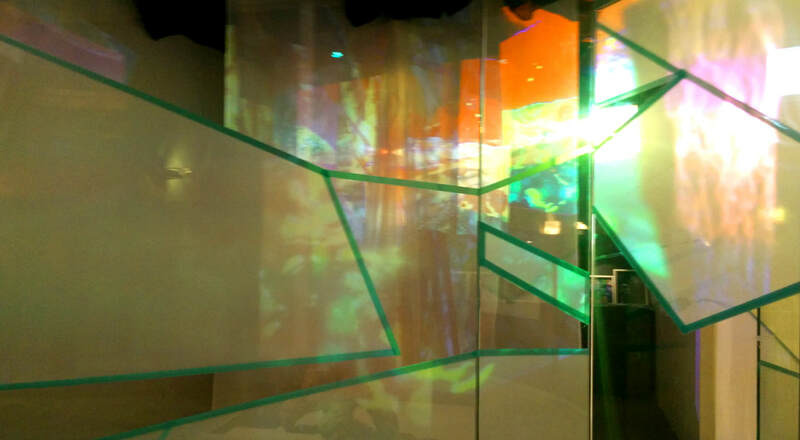 Designed specifically for one of the gallery rooms at the Center. 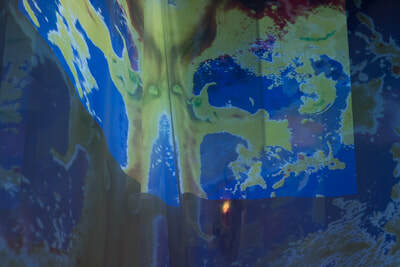 Night Lands 3 is designed to be shown across 4 large screens, or projected on four walls in a room to impart the full scope of the nature of water and its presence in our lives. Elements of time, space, archeology, geology, and fossils are evident throughout the ever fleeting imagery. 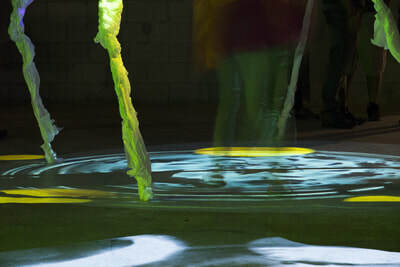 Living in Florida, we are surrounded by and enriched by water, but also occasionally sieged by it. 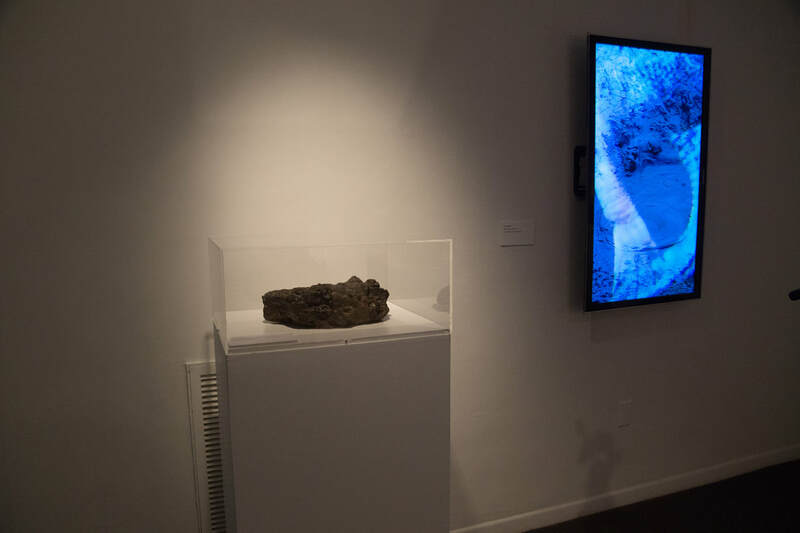 The Anthropocene is now readily impacting our coastlines and this work was finished during Irma, the largest hurricane in recorded history! Conversely, on a recent foray into Utah, Prabha was amazed by the role of water in shaping the canyons and mountains. 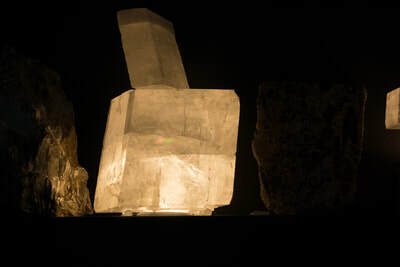 The ancient is brought to the present. 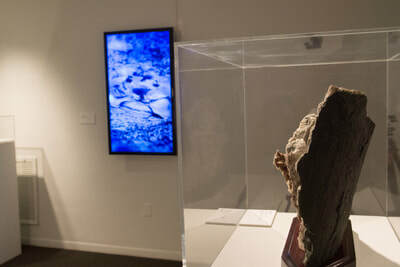 Geologic time contrasted with human experience. 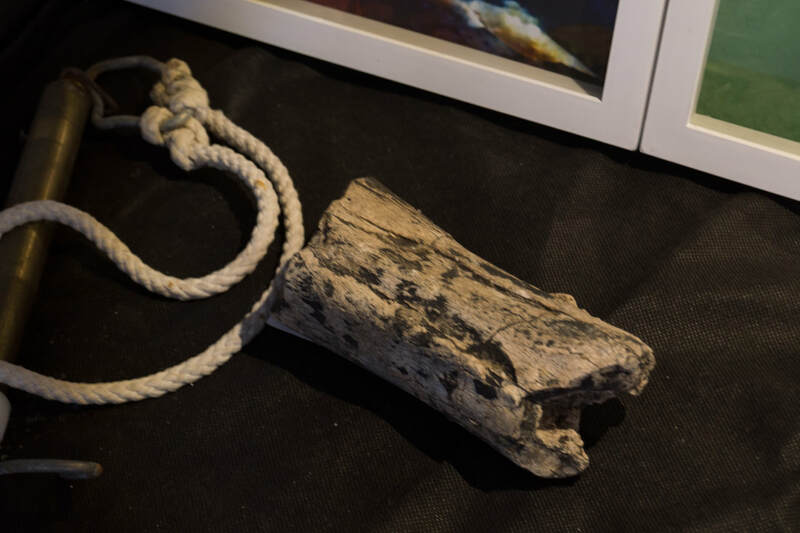 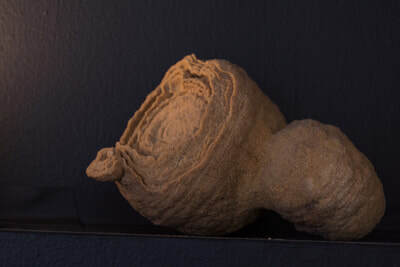 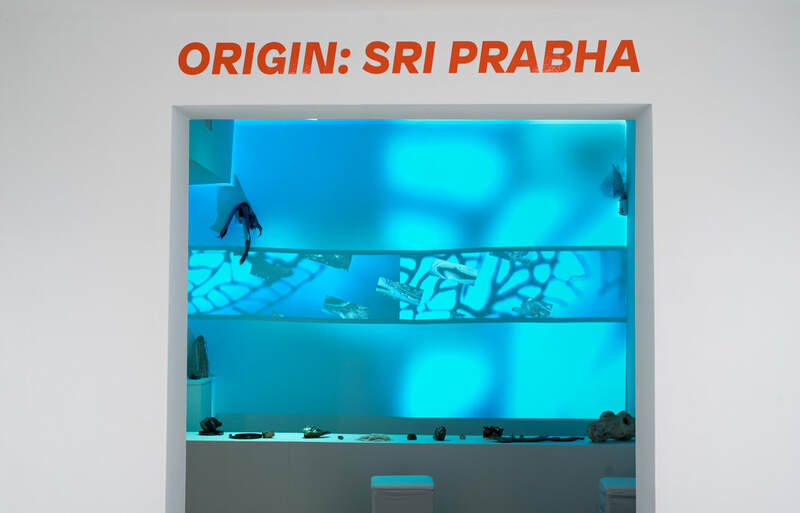 Prabha started creating portions of the work about two years ago which included collecting geological and mineral specimens and filming in Utah, Wyoming, Georgia, and Florida. 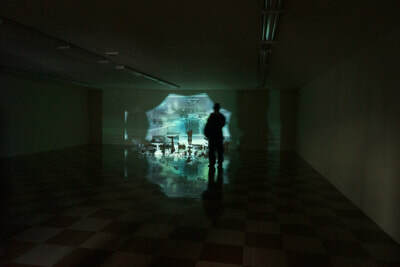 He thanks the Brush Creek Center for the Arts in Wyoming and Hambidge Center in Georgia where he had artist residencies that allowed time and the environment to begin and end this project. Night Lands 3 is an immersive poetic exploration of our connection to the oceans and our dependency on the water cycle. 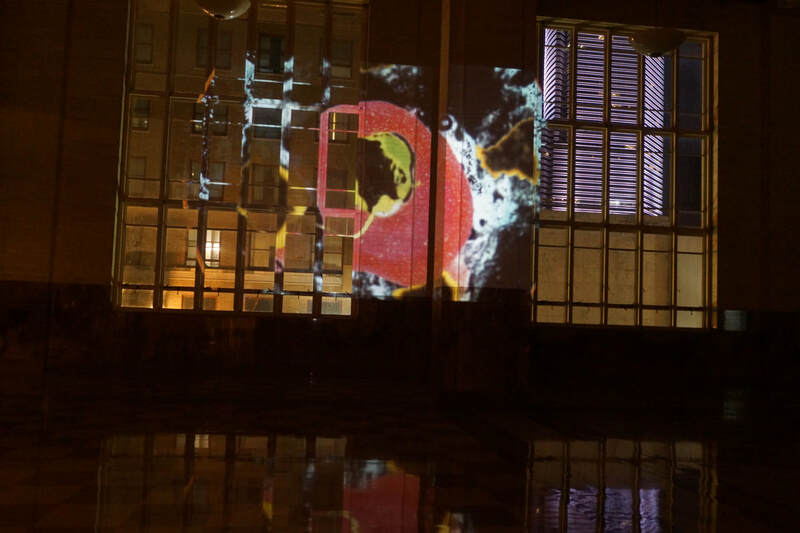 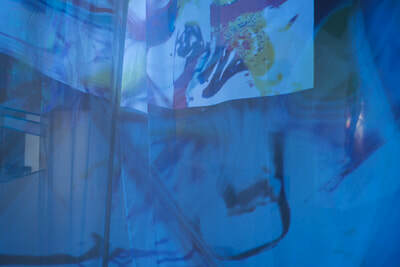 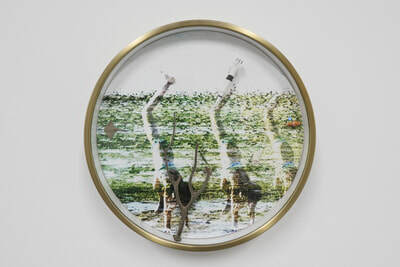 The work is designed to be shown across 4 large screens, or projected on four walls in a room to impart the full scope of the nature of water and its presence in our lives. 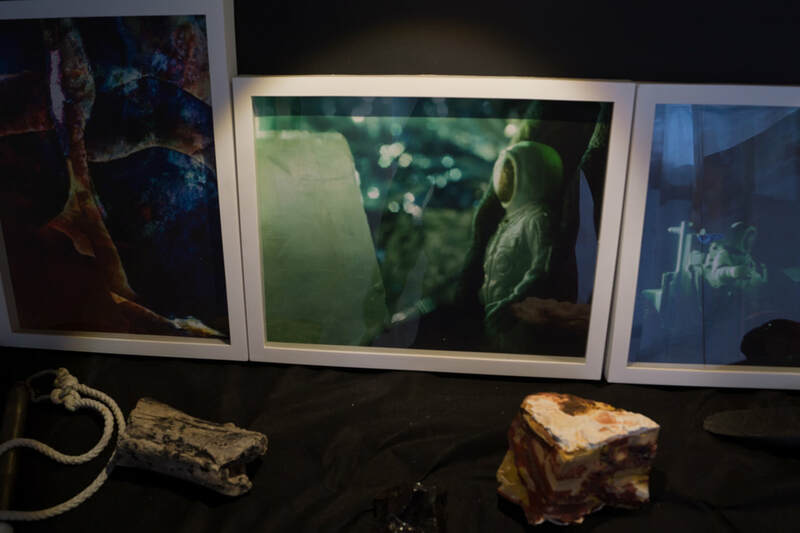 Elements of timespace, archeology, geology, and fossils are evident throughout the ever fleeting imagery. 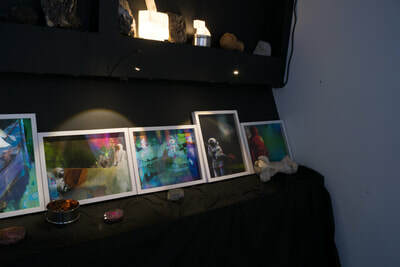 4 video projections, sound, mixed media, photo based prints, dimensions variable. 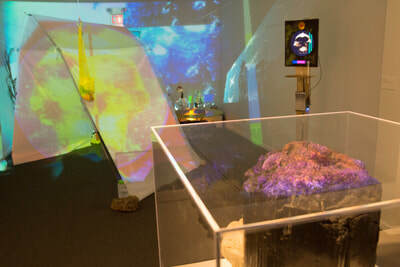 Broward resident Sri Prabha, a major installation mixed-media artist who was named New Times Best Visual Artist 2015, is showing new work called The Night Lands, featuring other-worldly video projections and actual geological samples such as optical calcite, volcanic rock from craters of the moon, and fossils he collected during a summer artist residency at Brush Creek Foundation for the Arts in Wyoming. "If you take someone and put them on a different planet — we are 50 years away from manned expeditions on Mars; it's not too far away — you realize it equalizes our ethnographic differences," Prabha says. 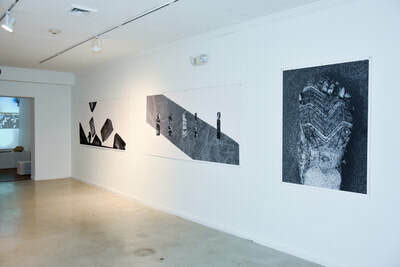 "The Night Lands looks at geology, time, consciousness, and how they all interplay in our daily lives. 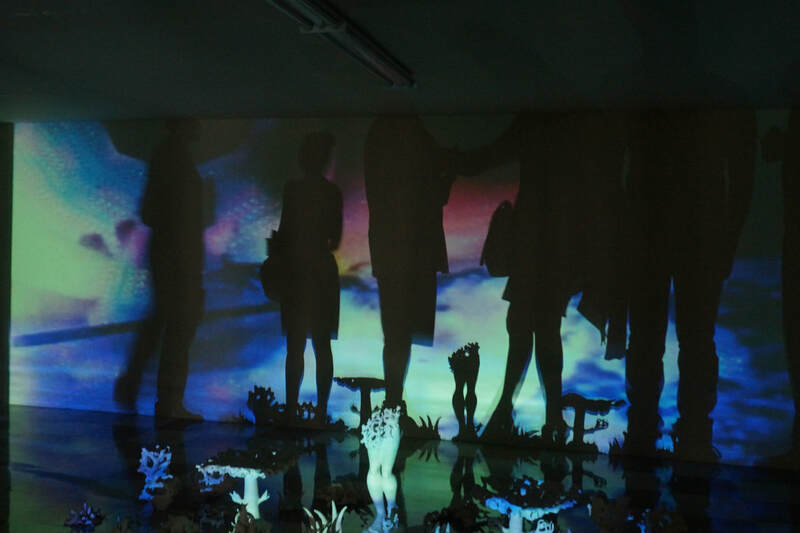 The idea is to feel like you are on an archaeological survey on some planet somewhere." 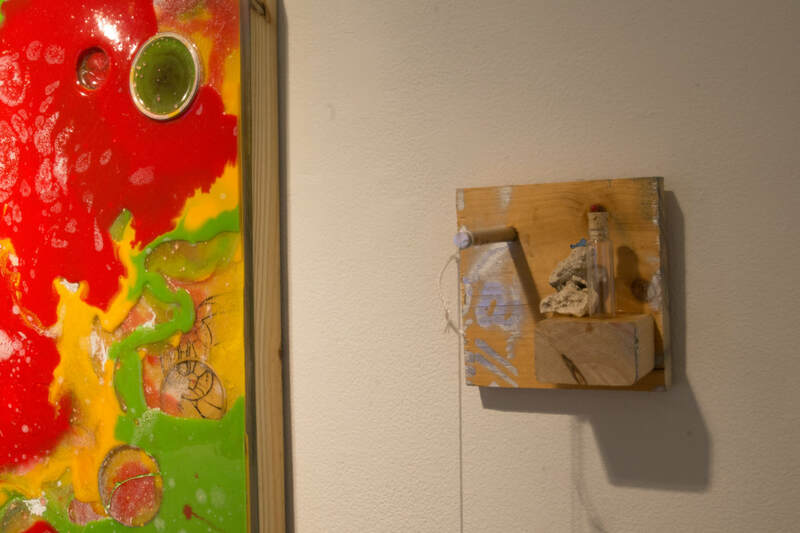 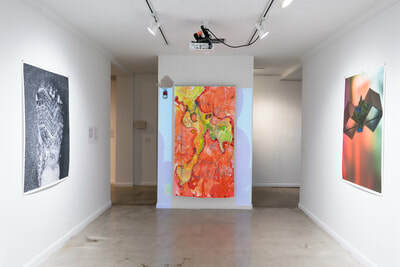 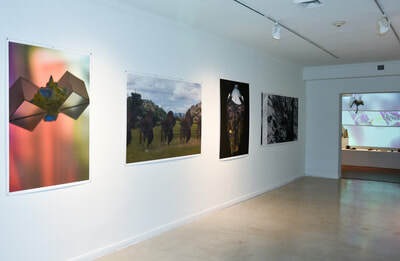 Featured in 100+ Degrees in The Shade,A Survey of South Florida Art.Curated by Jane Hart with assistance from Chris Ingalls,and Nina Arias. 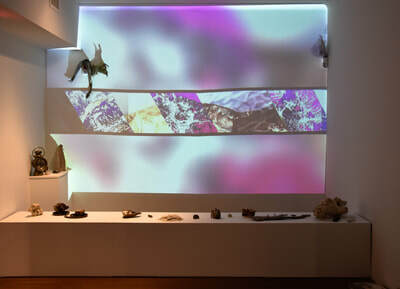 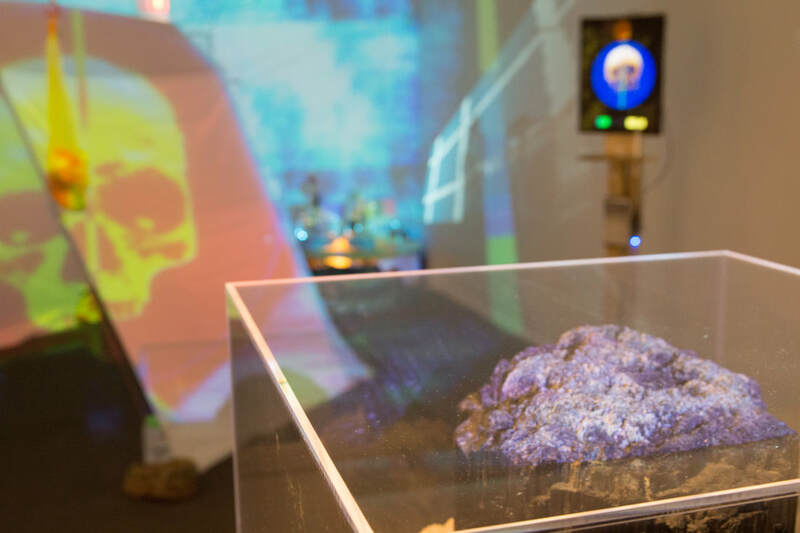 The Night Lands is Prabha’s latest immersive video installation featuring multiple video projections, photo based works, and geological specimens. One can see videos of natural elements from ancient forests, lava caves, fossils, flora and fauna fused with text, moving mandalas, and light fields to encourage meditation, and raise consciousness. 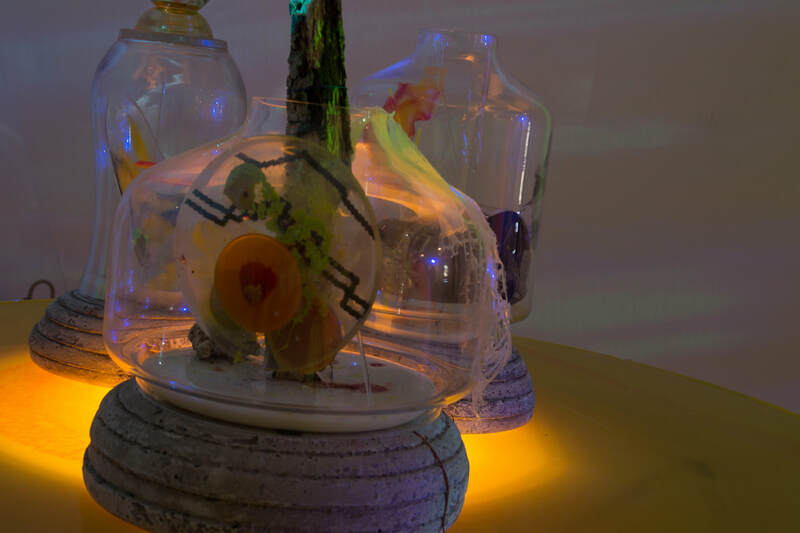 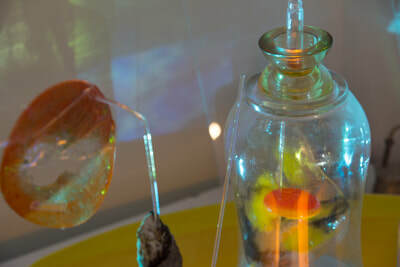 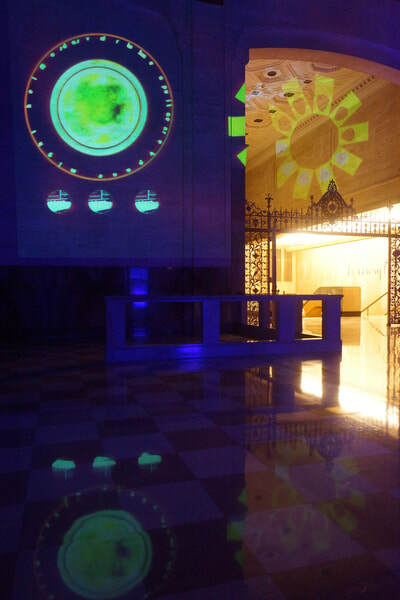 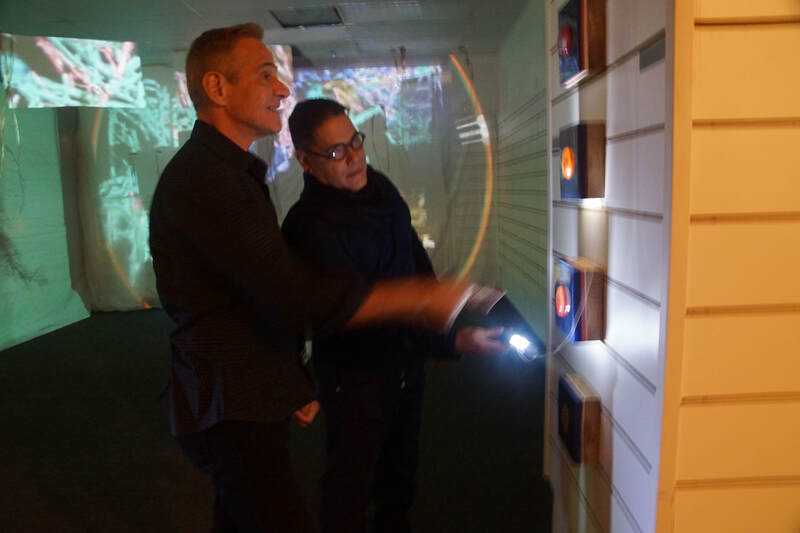 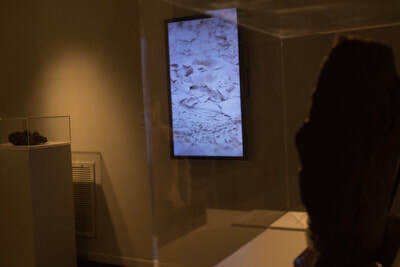 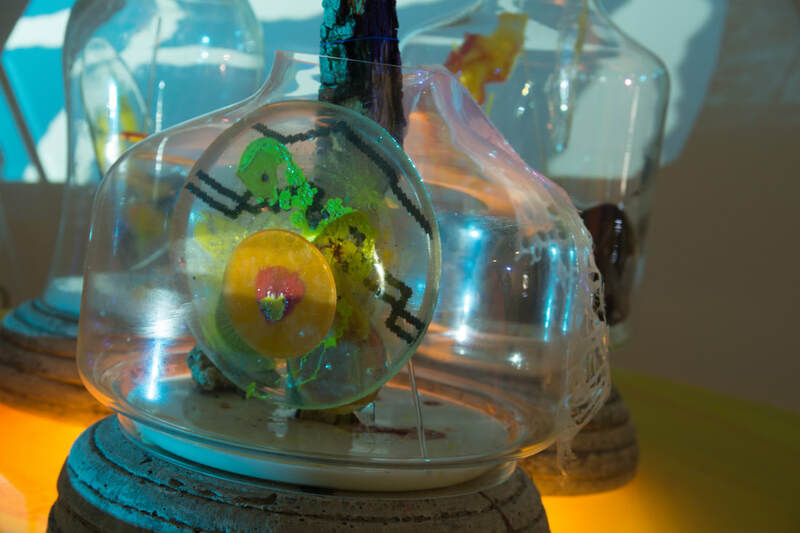 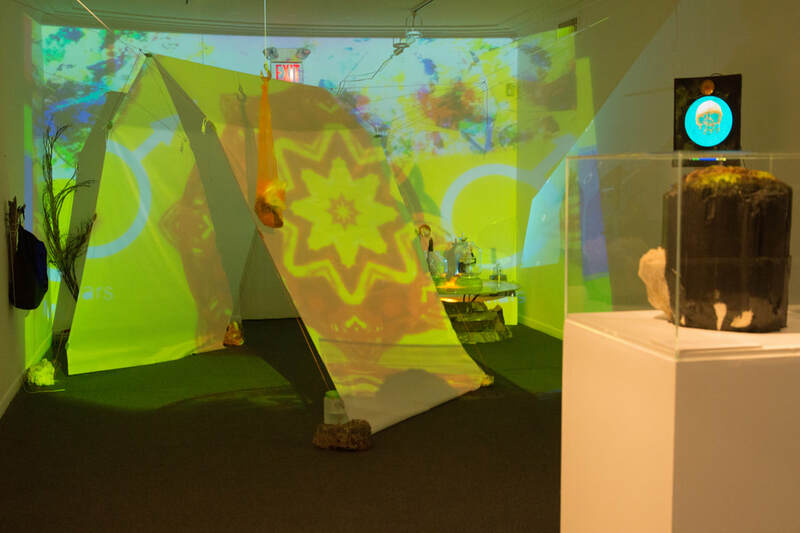 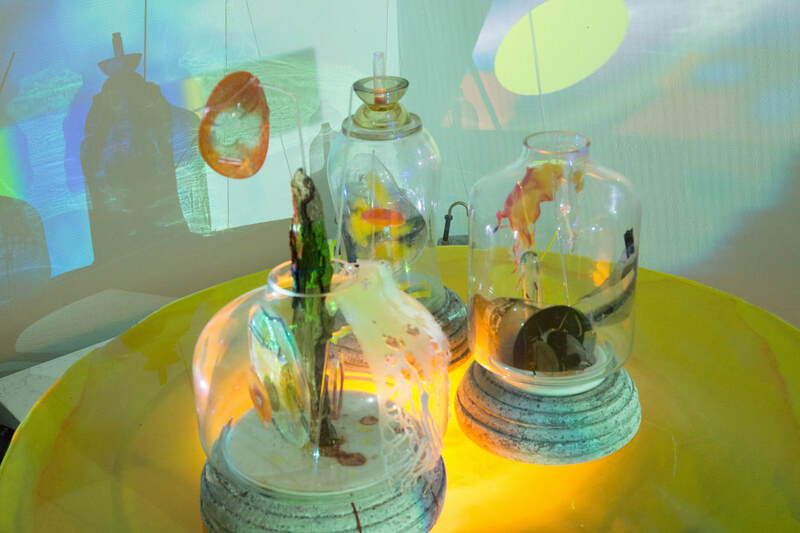 Walking thru the installation conjures ideas of deep time, the cosmos, archeology, and elicits a fundamental connectedness to nature, spirituality, and wellbeing. 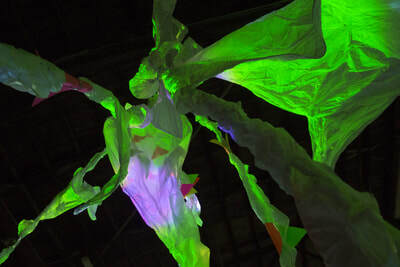 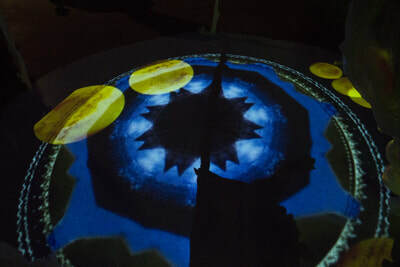 Through kinetic imagery and sound, participants are propelled on a far-away journey outside the stratosphere. 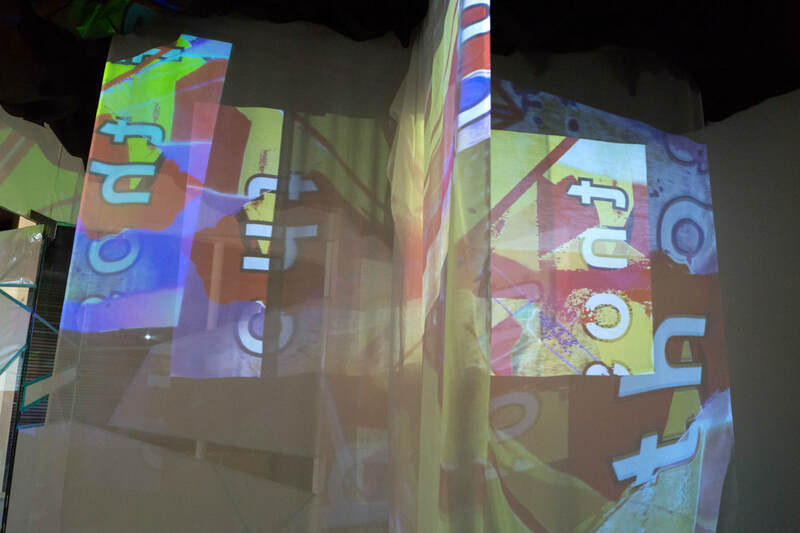 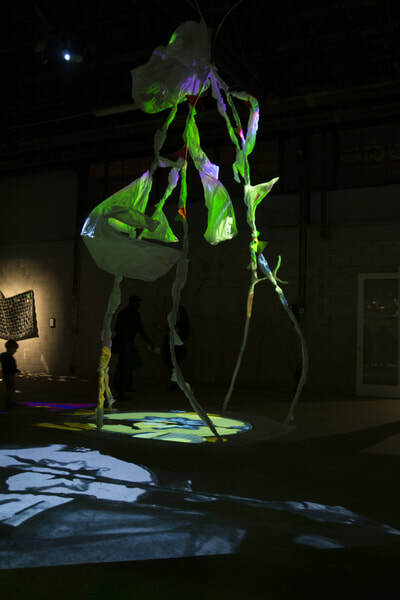 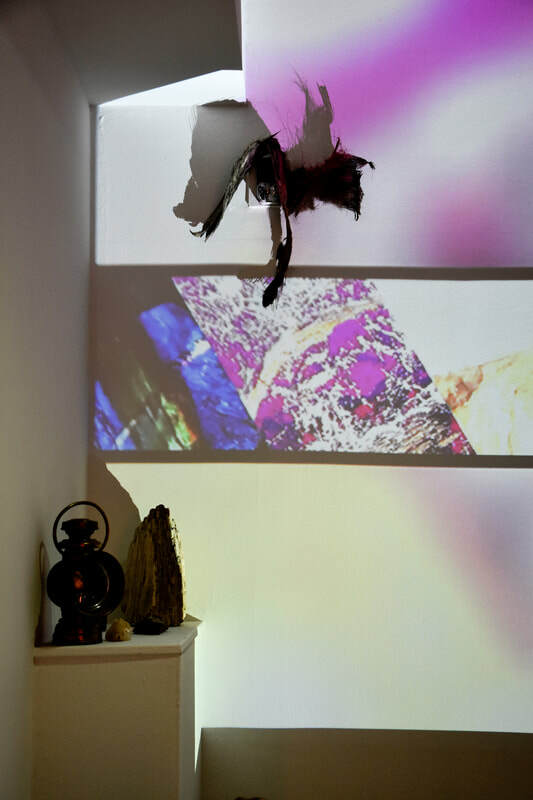 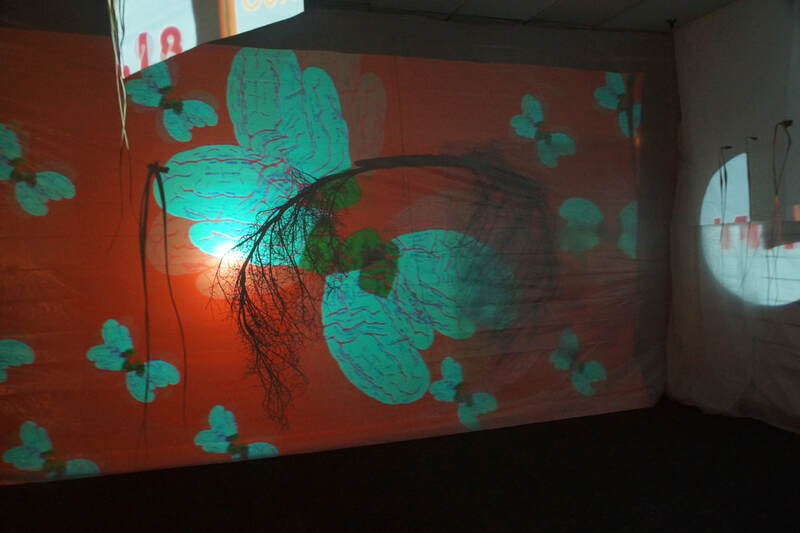 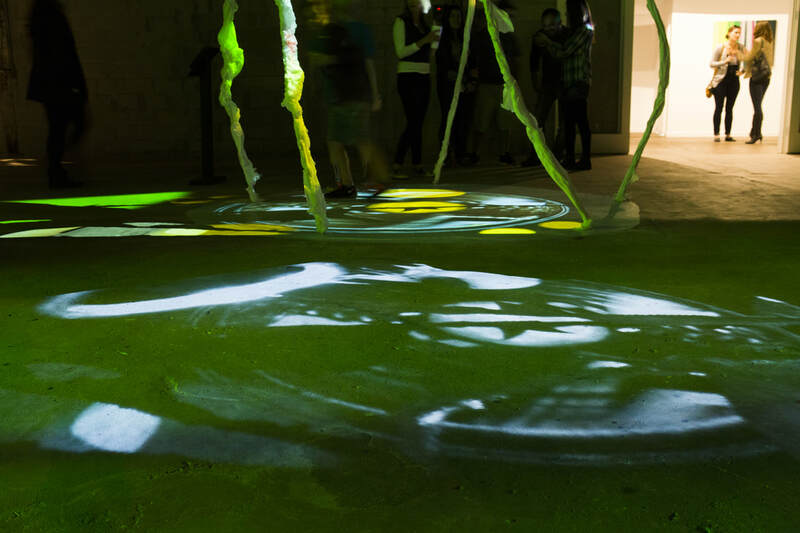 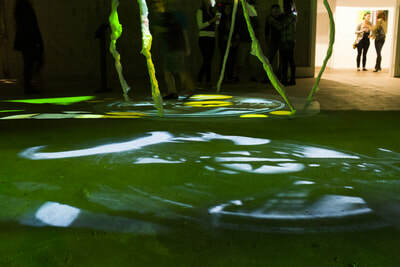 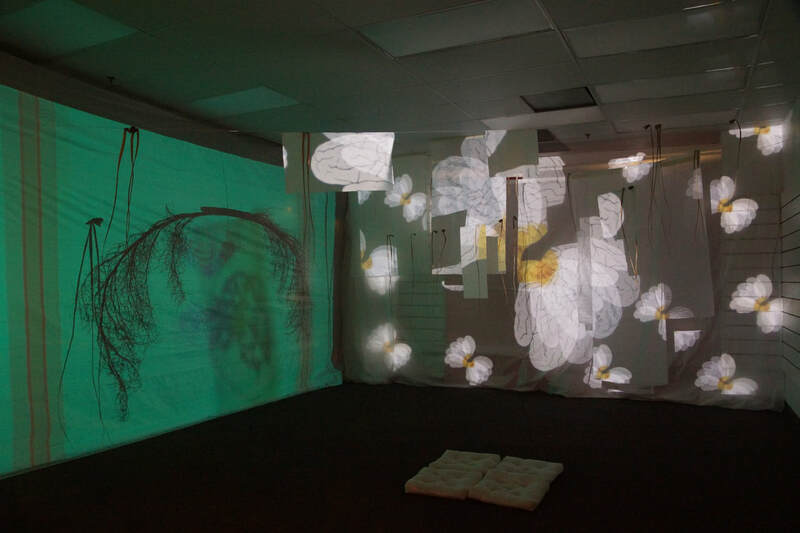 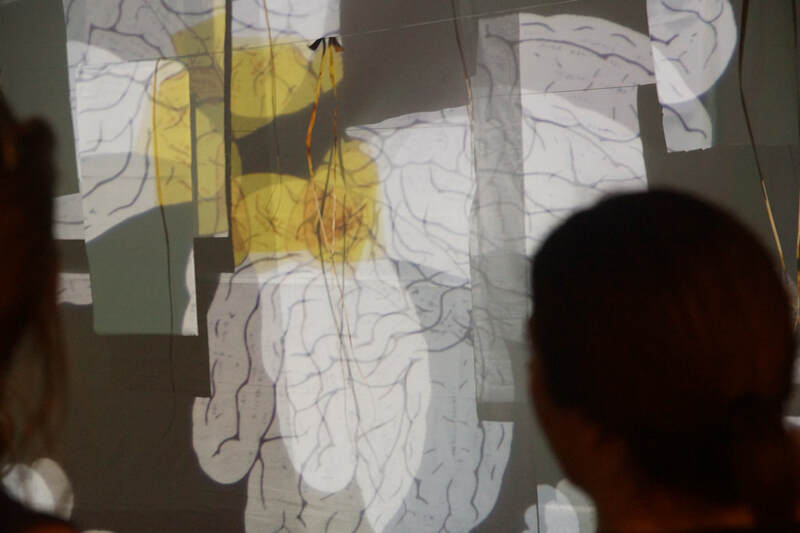 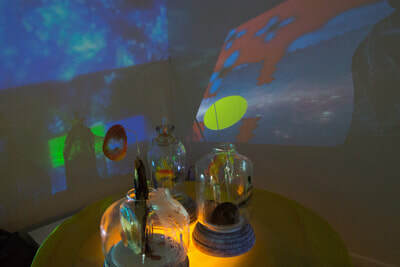 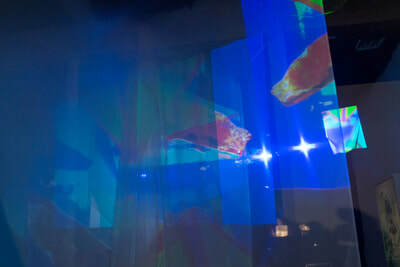 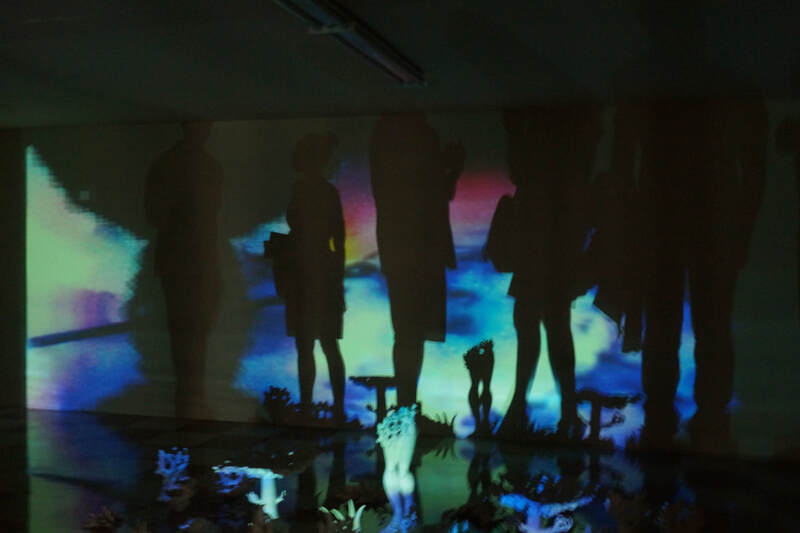 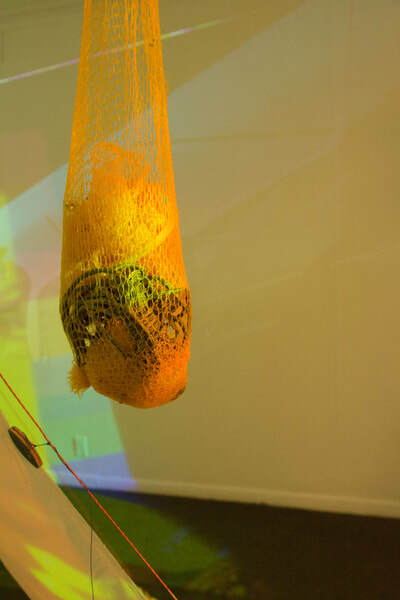 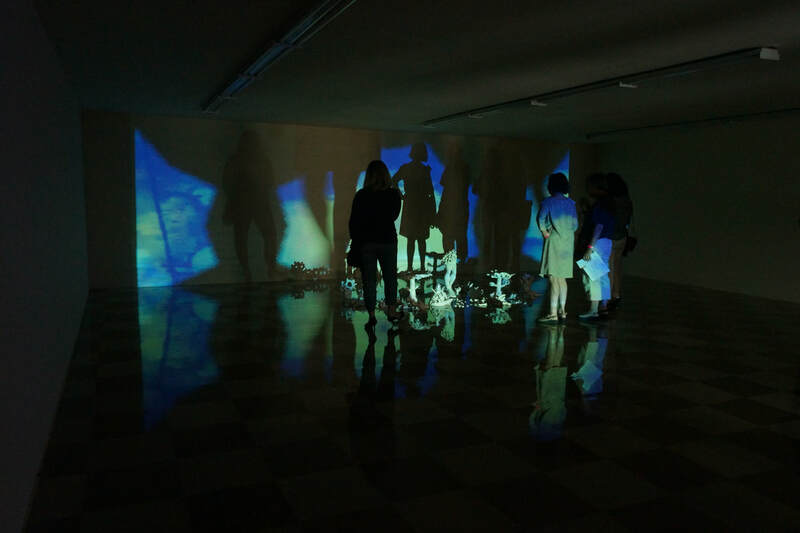 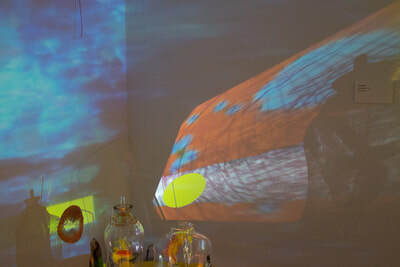 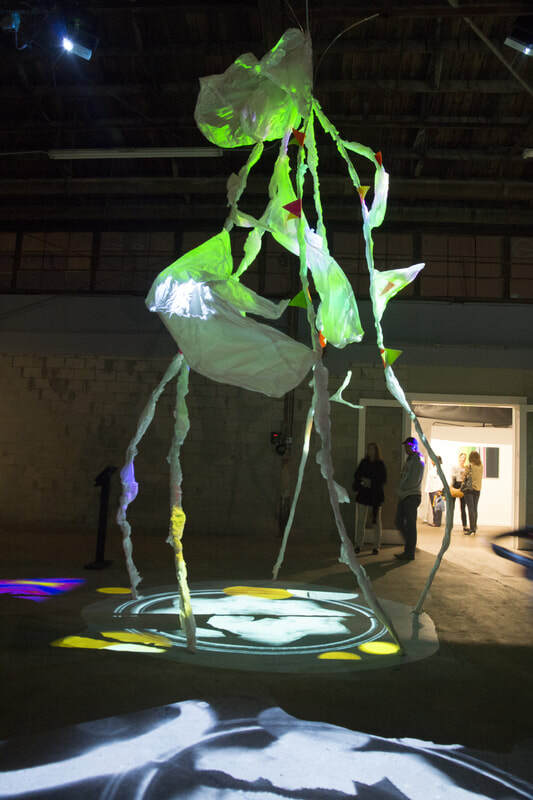 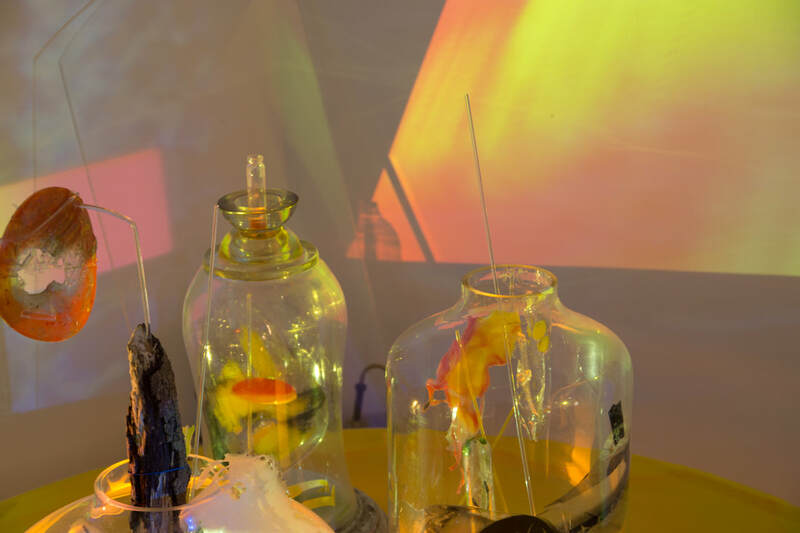 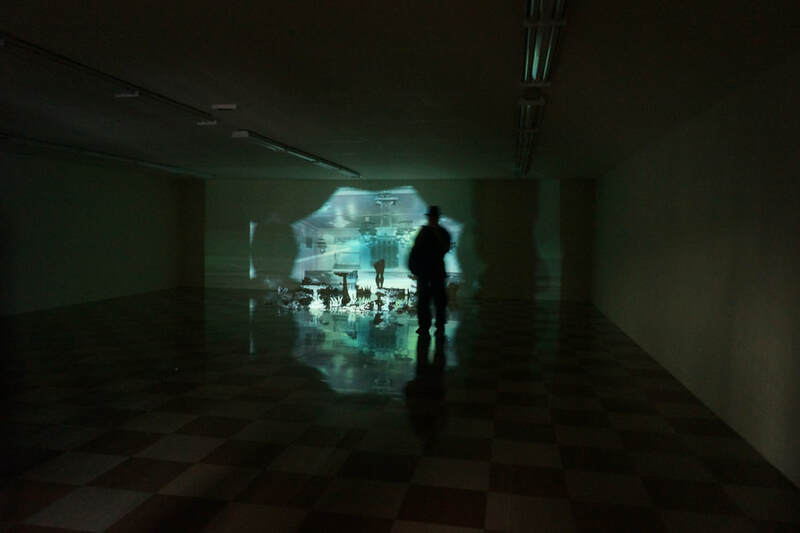 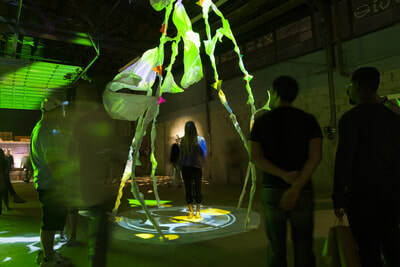 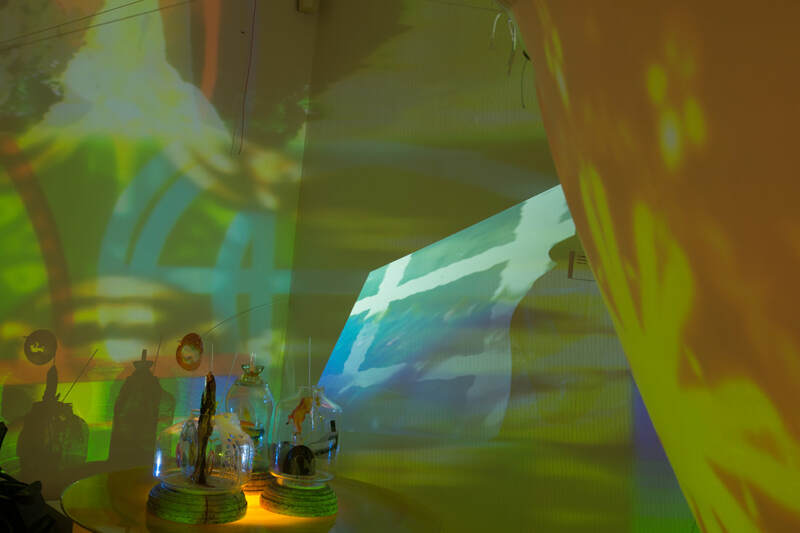 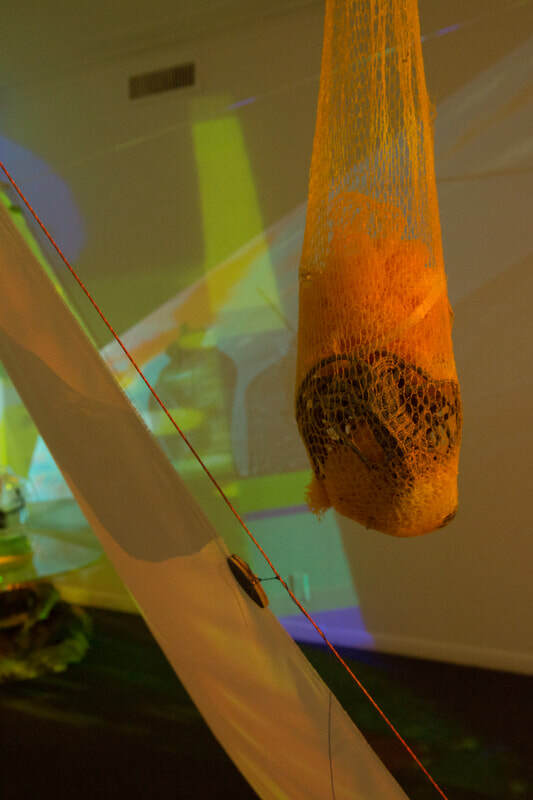 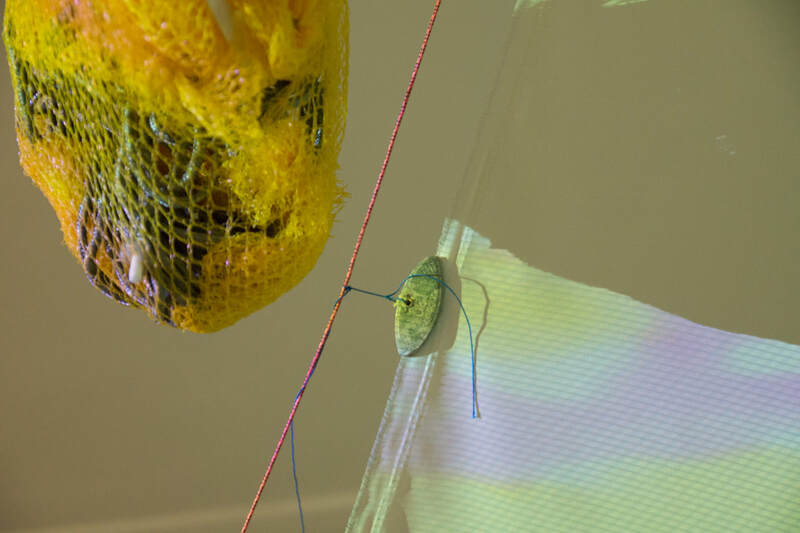 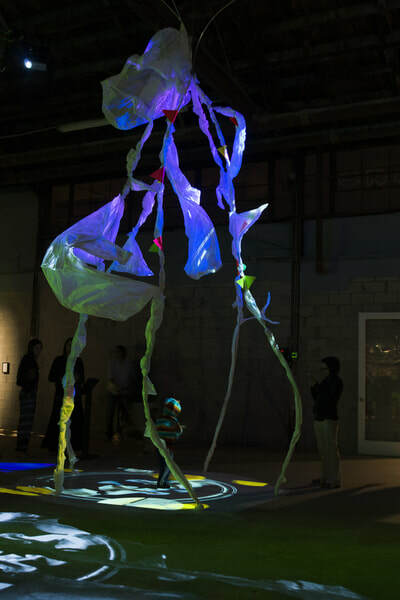 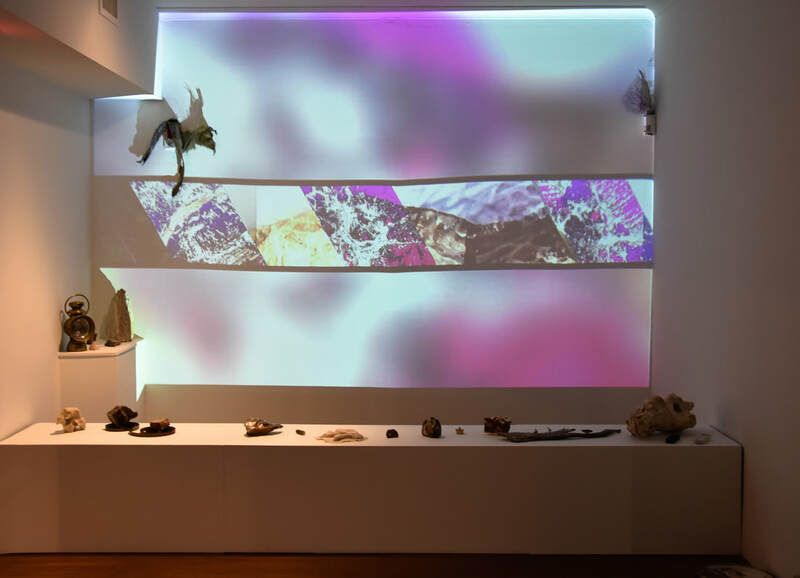 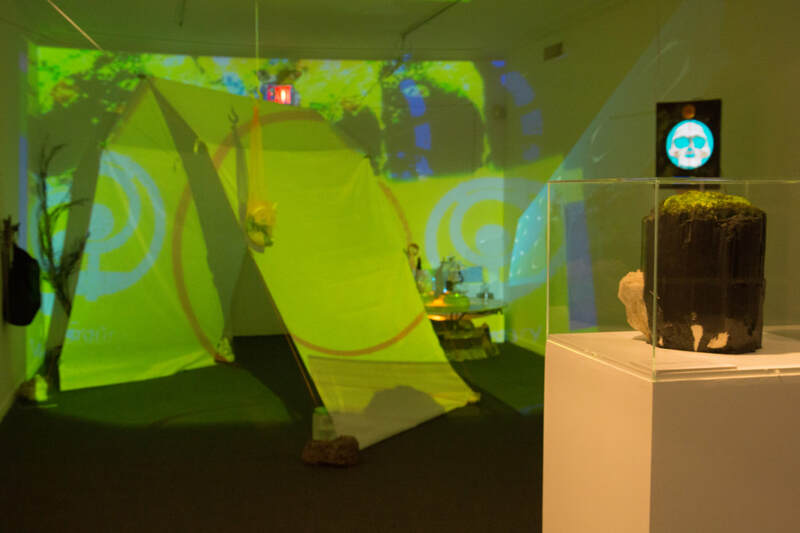 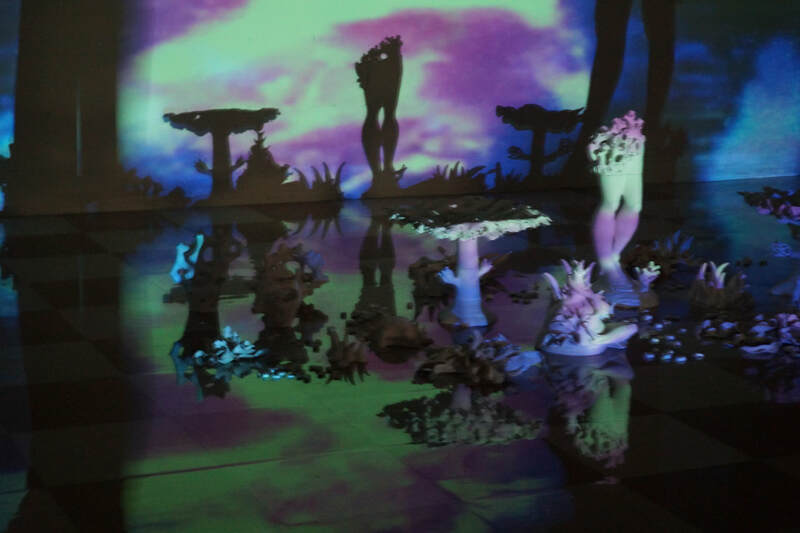 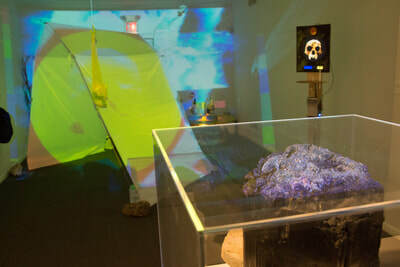 Prabha’s interactive and dynamic installation uses multi-video projections, mixed media, sound, and photo-based works to transcend physical space. No bystanders, viewers are transformed into explorers on a mission to decode their purpose. Fatvillage Projects Contemporary Art Space. This sculptural video work resembling a neuron or an amoebic shape examines what's first observed and what's remembered. 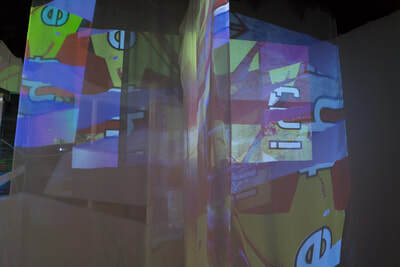 One projection reveals a set pattern of memories, while another projection is replaying the moments in real time with viewer interaction. 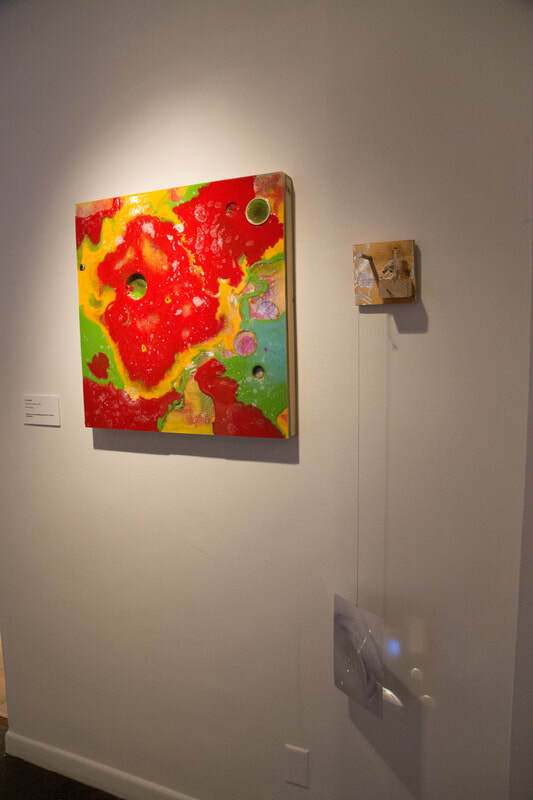 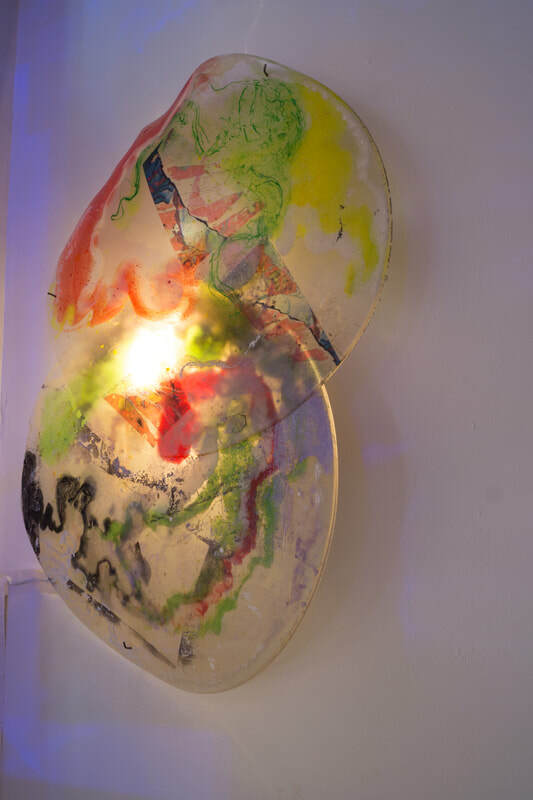 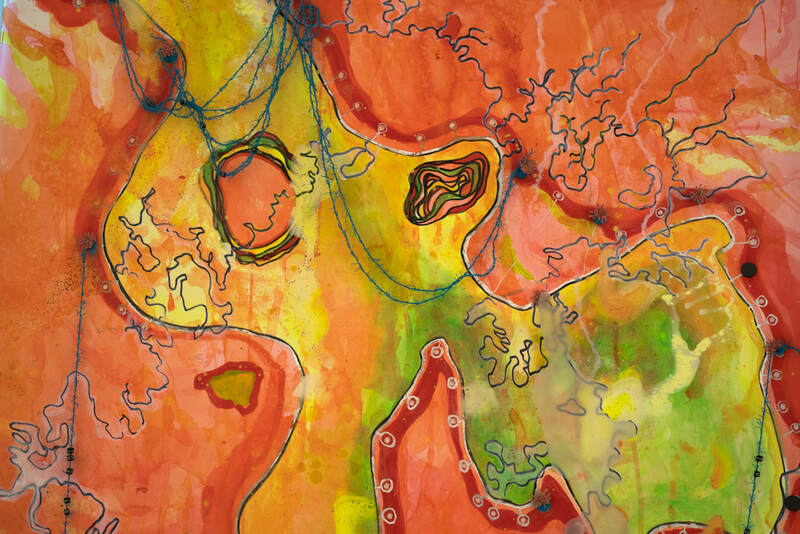 This work alludes to the collective unconscious,neural memories, and connections within. 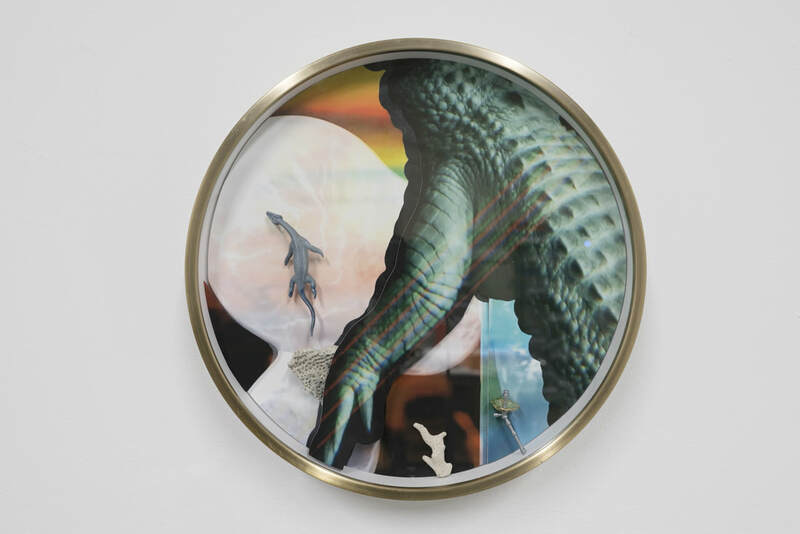 Video and mixed media, Dimensions Variable.﻿2014. 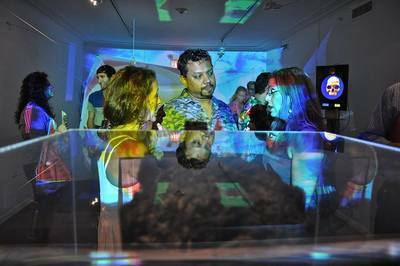 Art and Culture Center of Hollywood. 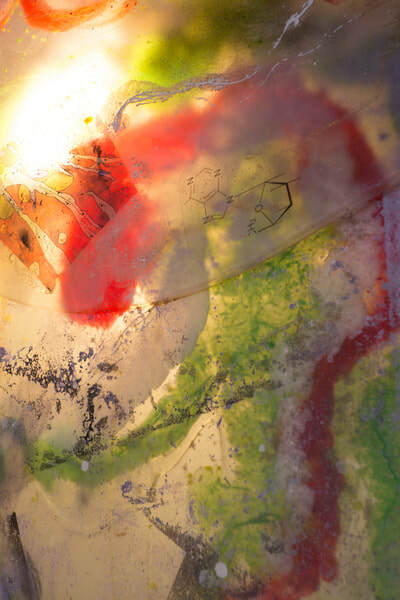 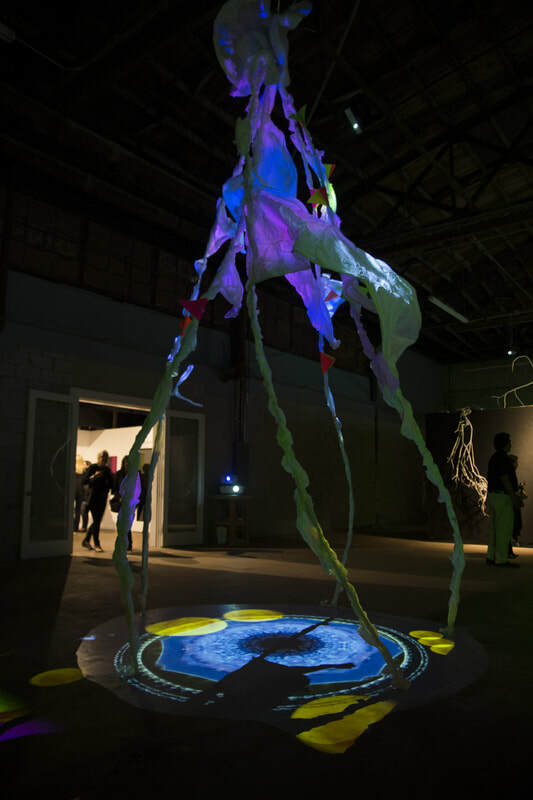 Outpost is a site specific installation inspired by space, biology, and exploration. 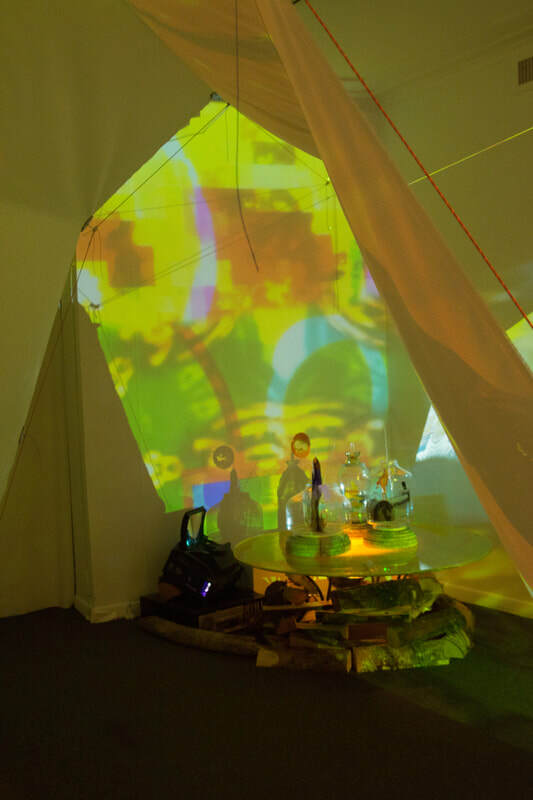 An otherworldly campsite is presented bathed in video and natural sounds. 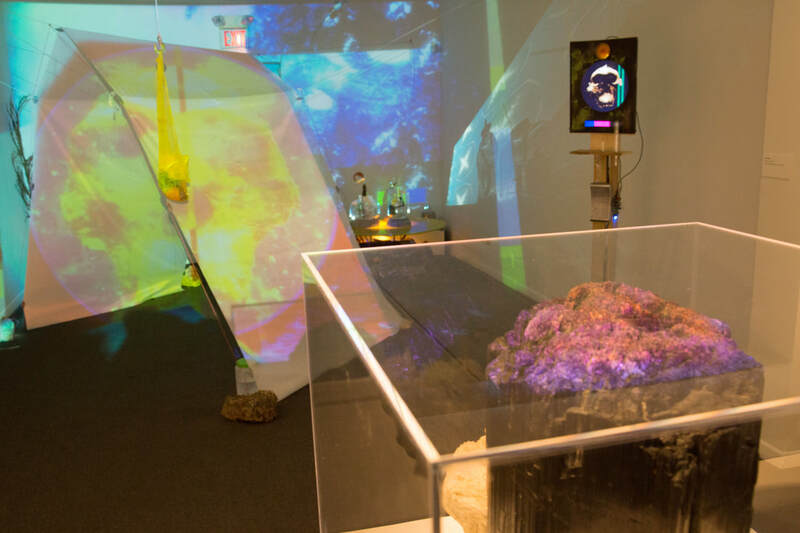 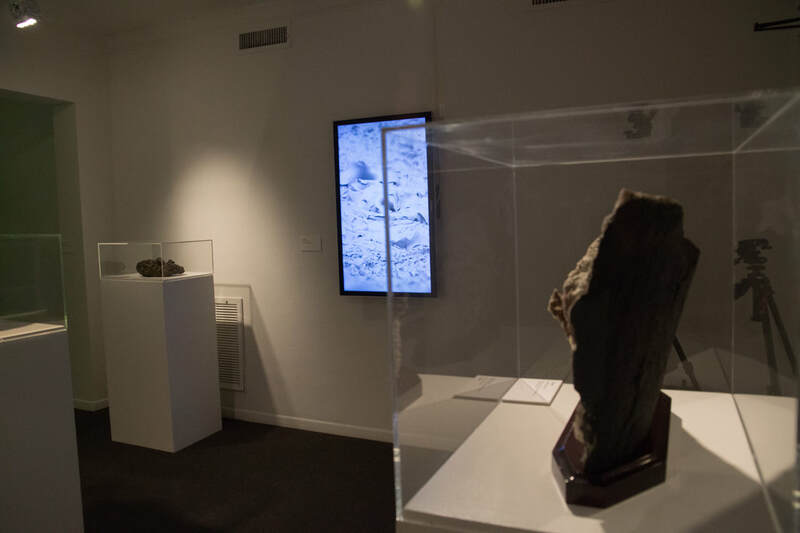 On view are basic shelters and a symbolic fireplace surrounded by mixed-media works inspired by images taken by the Hubble Space Telescope, particle physics, microbiology, and an ongoing collaboration with the Patricia and Phillip Frost Museum. 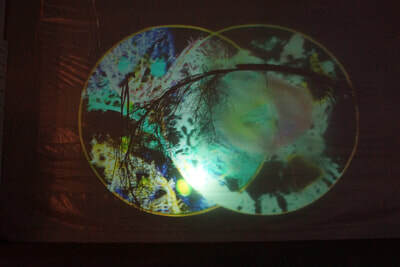 Mixed media with four projectors and audio,dimensions variable. 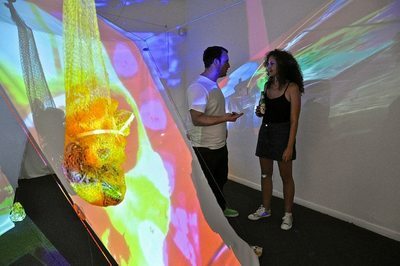 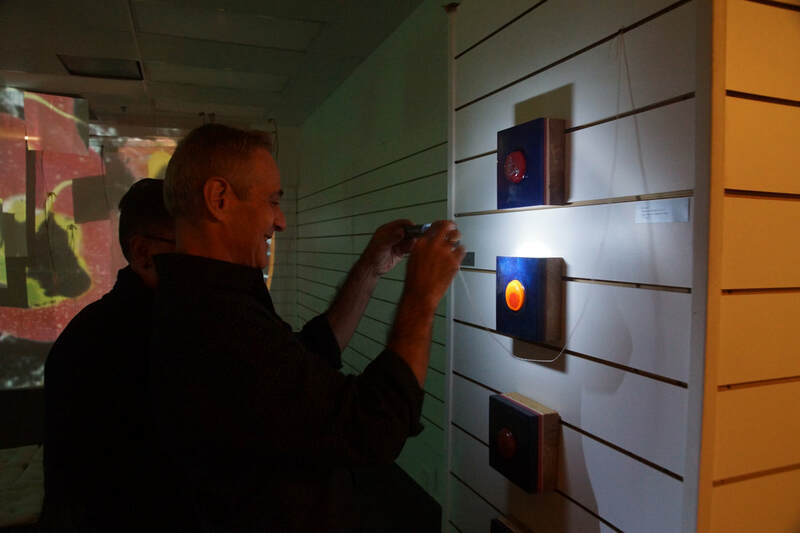 July 26th- August 30th Haptic Colors at Fatvillage Projects Contemporary Art Space. 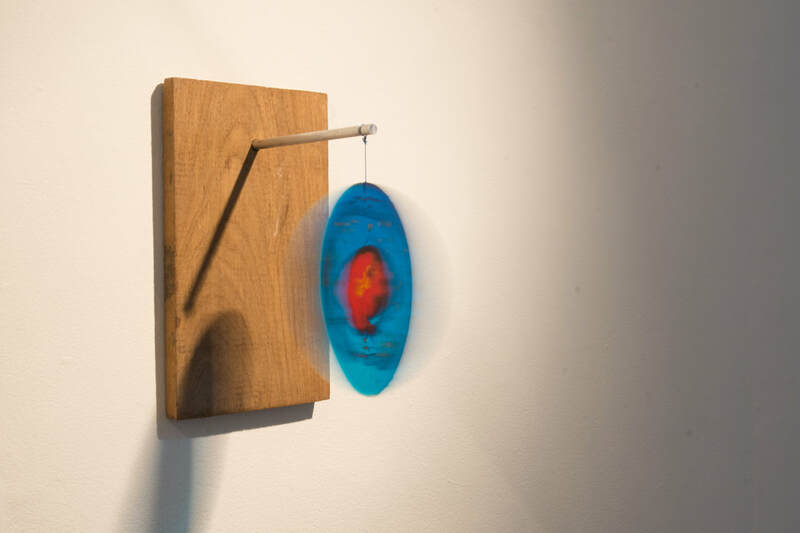 Haptic; adjective:Relating to the sense of touch, in particular relating to the perception and manipulation of objects . Noise Reduction Experiment #3, Video Installation. 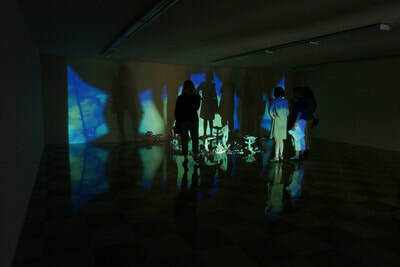 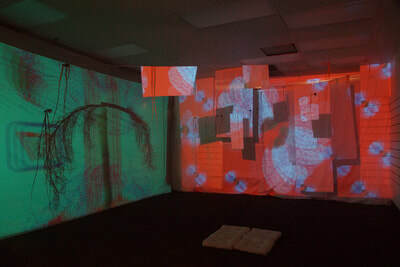 Multiple projectors,mixed media, dimensions variable. 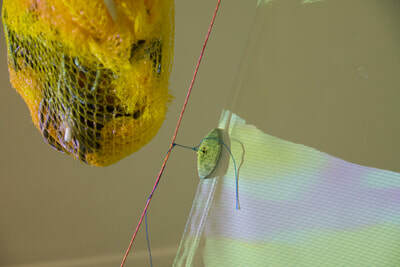 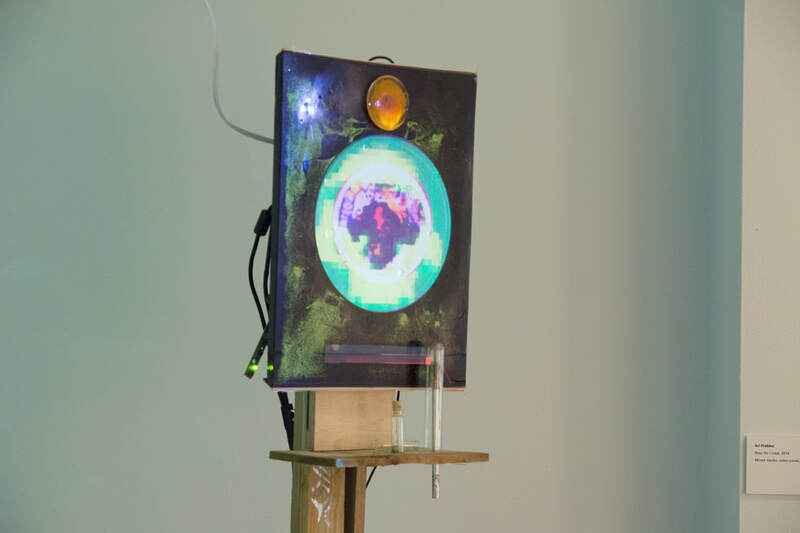 Mixed media, video and sculpture. Collaboration with Charles Falarara. 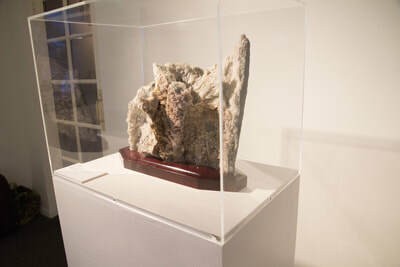 Sculpture by Charles Falarara. 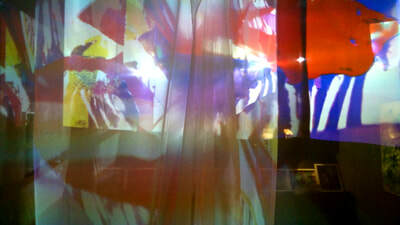 new rhythms compressed from Sri Prabha on Vimeo. New rhythms is about viewing the gardens and environment of the Dallas Arboretum in a new way by especially slowing down the time factor that we would normally observe such phenomenon. 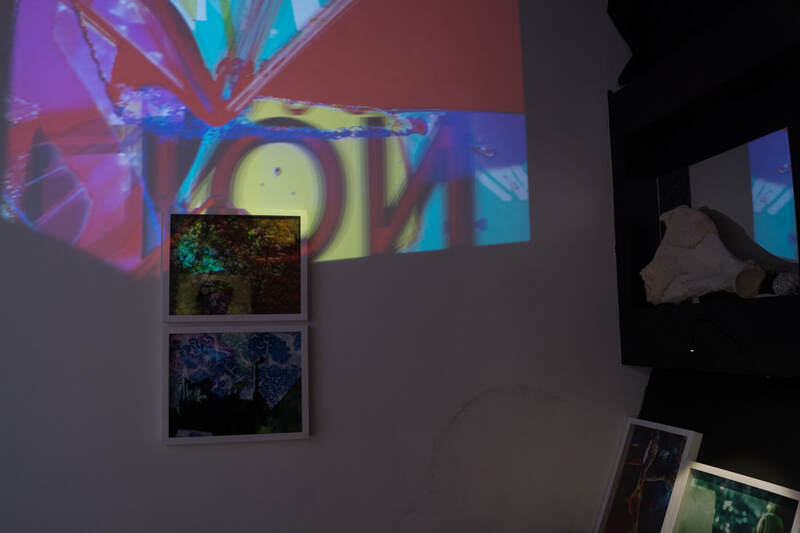 I've used a special method to slow down everything that we would normally experience at 24 fps and present the work shot at a thousand frames per second and now we see it in that slow motion format. The rhythms of normal speed become something that transcends our natural ability to see things at this rate.The soundtrack for this was from an African drumming passage, which was slowed down considerably. 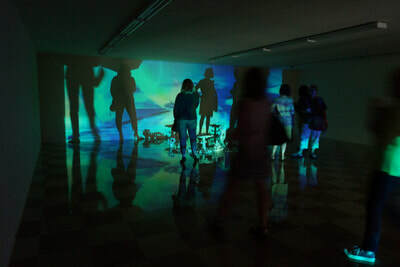 Both human and non-human rhythms have been drastically slowed to their Primal components to be reviewed and experienced from completely alternate perspective. 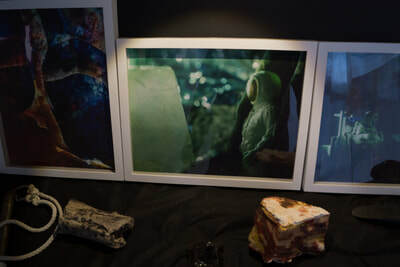 Ganymede's Shadowmancer. 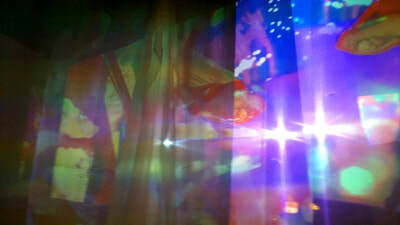 Excerpt. 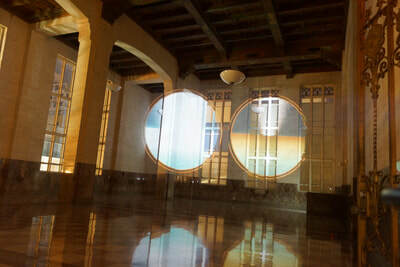 Infinite loop. HD video. from Sri Prabha on Vimeo. 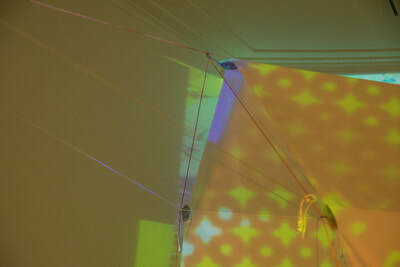 Cosmos 1 from Sri Prabha on Vimeo. 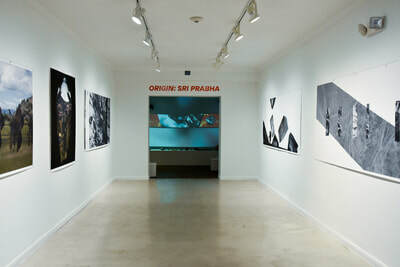 Sri Prabha, A Wistful Dance of Archaic Particles Emanating Splendor, 2015. 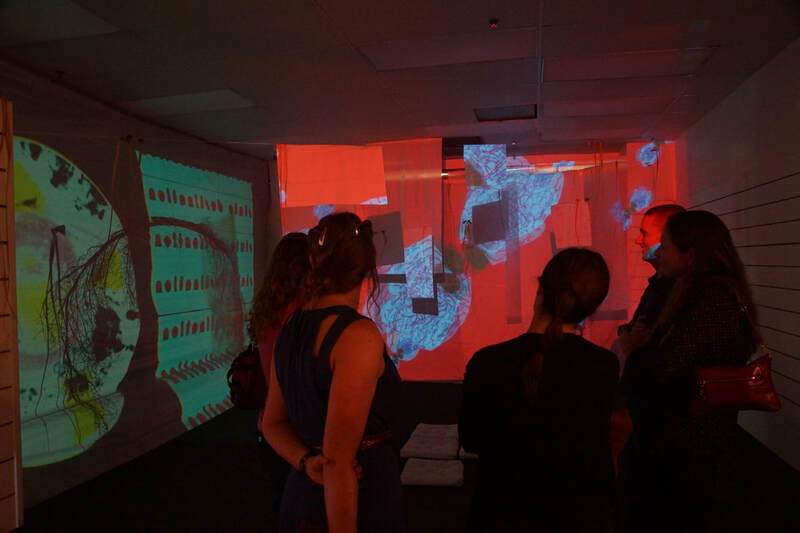 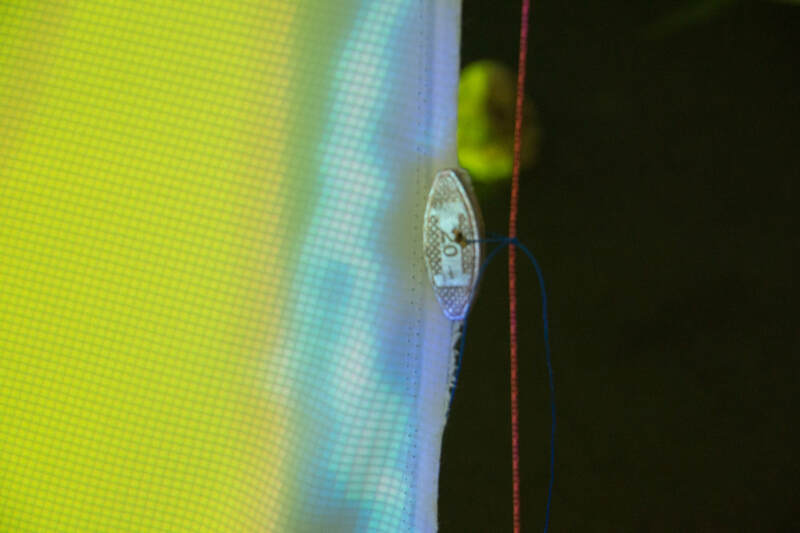 Installation Video, Public Art Fallout 2015. from Sri Prabha on Vimeo.